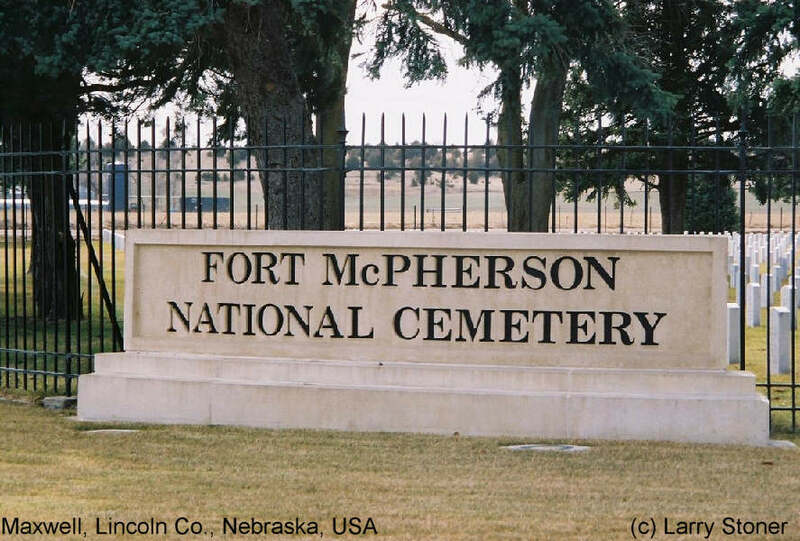 These words mark the entrance to Fort McPherson National Cemetery, chosen by the United States as the final resting place for hundreds of persons who died on the Nebraska frontier - many of them originally buried in U.S. Forts. Bodies have been brought to Fort McPherson from 23 different cemeteries on or near old, long abandoned Forts, originally located in Idaho, Wyoming, Colorado, Nebraska, and the Philippines. The cemetery, established 3 March 1873, consists of 20 acres. Beneath cottonwood trees are the long rows of white stone markers so typical of military cemeteries, along with traditional monuments. Small white slabs mark the burial locations of 361 unknowns. Still visible ruts of the Oregon Trail run through the cemetery.